Cleaning makeup brushes. What a blooming chore. What a necessity though. Like everyone else out there, I hate washing my makeup brushes, it takes so long and it's hardly exciting stuff. As a result I'm guilty of using brushes that are dirty. 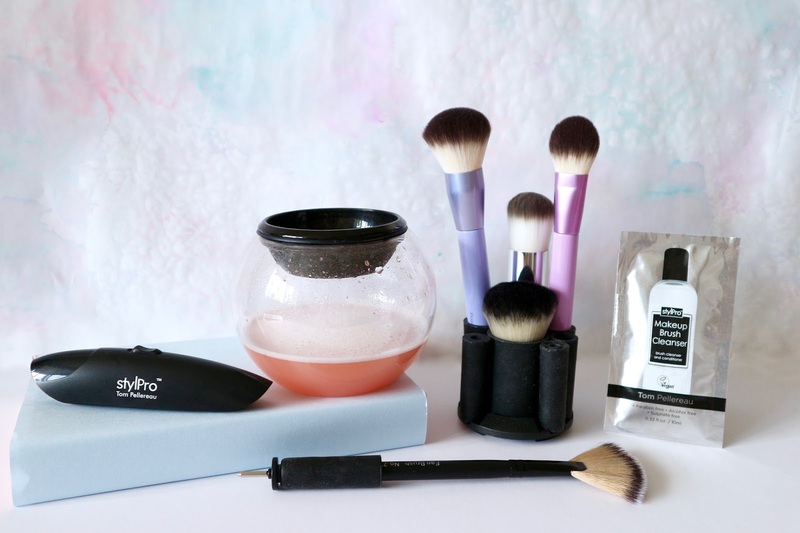 Dirty brushes mean bad skin, increased bacteria on my face and in my makeup and poor makeup application, even damaged brushes. Nightmare. It's been my mission of late to improve my brush cleaning system and get a routine going. I wanted to find ways that are quicker, easier, more eco friendly and dare I say it, more fun! Here's some of the ways I've been dealing with the brush cleaning situation. Sometimes I really need a dirty brush straight away. Sure I could use another brush but sometimes there's just that one brush in your collection that is so specific and perfect, another just wont do. This is where I end up reaching for my Ecotools Makeup Brush Cleansing Cloths. Essentially these are like face wipes for your brushes. 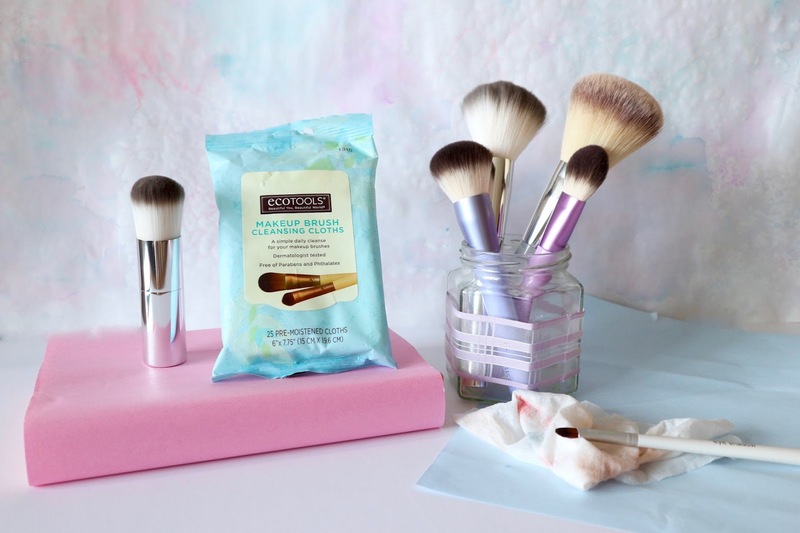 They're pre-moistend cloths that you can use to wipe the makeup residue off your brushes. As expected they don't provide a thorough clean but they get the excess buildup off the outside of the brushes and provide a cleaner brush than you would have before. 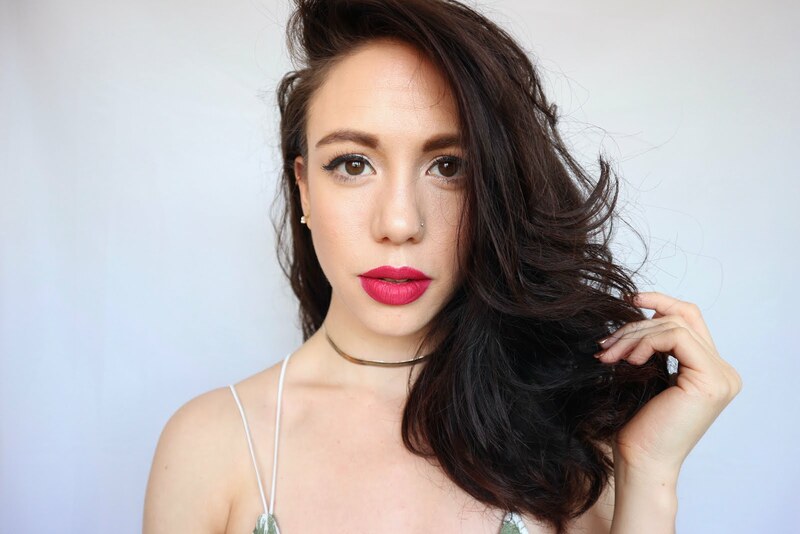 They handle all my makeup really well from oil based to powder and foundation. They even can tackle the hard to budge Bellapierre Kiss Proof Lip Cremes. As the brush hasn't been soaked it dries very quickly and you can use it almost straightaway. It's good to note that these wipes don't leave any oil or other noticeable residue on the brushes either. I chose the Ecotools brand because in terms of green and eco-friendly standards they beat the rest of main stream brand options out there. These cloths are mades from FSC (Forest Stewardship Council) certified material (I can't find what material though, I'm assuming a cotton blend?) and they are cruelty free. Ingredients-wise they are free from parabens, petroleum-based ingredients, phthalates and sulphates. As a whole the ingredients are surprisingly 'clean' with only one ingredient (Phenoxyethanol - a preservative) (rating 4 on EWG Skin-deep) making me pause on using them. However this ingredient is third to last on the ingredients list so I'm not over troubled by its presence. These cloths are also Dermatologist tested. 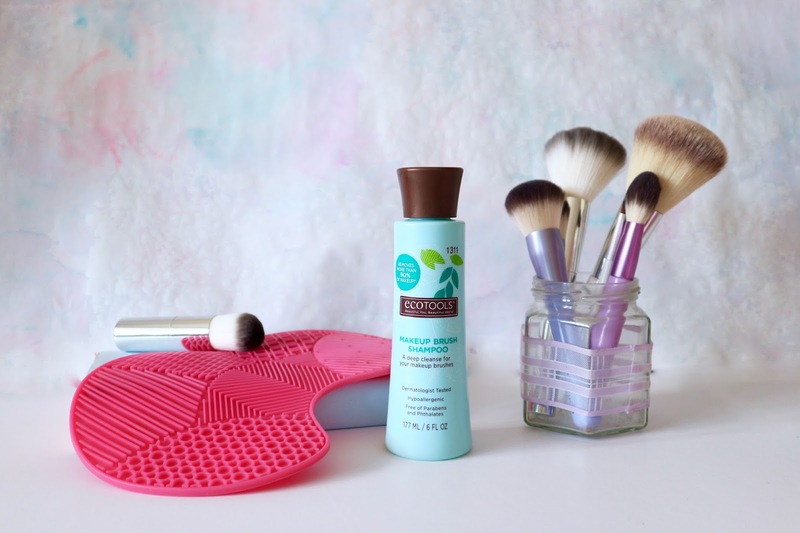 FIND IT: Boots (£6.99) / Superdrug (£3.99) - clearly well worth shopping around! Earlier I mentioned trying to make brush cleaning more 'fun' and you might be thinking 'Impossible!' However, I treated myself to a much reviewed StylPro and I can assure you that while brush cleaning still isn't the highlight of my week, this little machine has certainly added a bit of fun to the process. 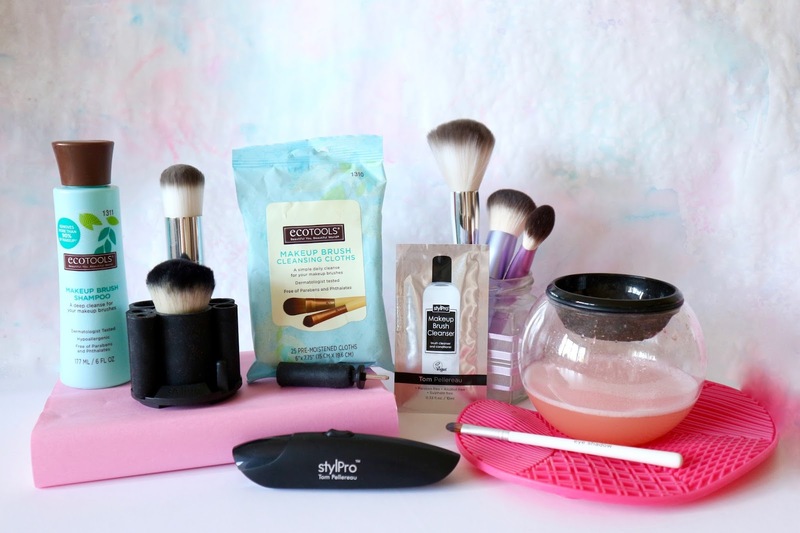 The StylPro is a little machine that rapidly spins your brushes to deeply clean them and then rapidly dry them in literally less than a minute. The set contains a dinky washing bowl, eight different sized rubber brush holder attachments, the spinner (I don't know what it's officially called so I'm rolling with this) and two sachets of cleaning cleanser solution. All you do is pop the solution, or your own mix of water and cleanser in the bowl, pop your brush into one of the holders, attach the spinner, dunk the brush in the bowl, spin for about 10 seconds then remove from the solution, spin for about 10 seconds again and boom. Clean and dry. Epic no? Yes, yes it is. The rapid spinning forces the bristles outwards so the solution can clean deep into the brush and similarly the moisture is wicked away from deep inside the brush while drying. I was concerned that the bristles may end up wonky on my brushes, but so far these fears haven't come to pass so all is good. I would say not to mash the brush about too much while spinning as that can cause the bristles to tangle a little. This really does deeply clean my brushes - even the really nasty clogged ones. The cleanser that comes with it is also really great. It is vegan, paraben, sulphate and alcohol free and the ingredients are minimal and very clean, mainly comprised of different oils. Eco-wise, this definitely saves on how much water I use while cleaning as I'm not constantly running a tap and you use minimal water in the bowl. I think this little gadget needs a full in-depth review of it's own so if you want one, let me know in comments as there's a lot more I could cover on it. I don't know about you but sometimes, just sometimes I can find cleaning quite therapeutic. On these rare occasions I sometimes wash my least used brushes, and the brushes that can't be cleaned in my StylPro such as my oval brushes where the brush sits at a right angle to the handle. For these I whip out my silicone textured cleaning mat. You can find these everywhere in every shape, colour and size. Mine provides a variety of different textures to use to scrub your brush into and get your brushes clean. Mine also has a dip in the shape to fit around the plug hole. The obvious drawbacks are that washing this way uses a lot of water and is laborious and tiring. Not to mention the fact that brushes take at least 12 hours to dry if not longer. However, sometimes it's just got to be done. To get the job done efficiently I have been trialling another Ecotools product, their Makeup Brush Shampoo. Like with their cleaning cloths, this shampoo is cruelty free and free from, parabens, petroleum based ingredients and phthalates. The bottle is also make from 40% post-consumer recycled plastic. Again the ingredients are impressively 'clean' with the exception of the Phenoxyethanol and potentially the undisclosed 'Fragrance' (Parfum). It does smell pretty great though! Like the wipes this shampoo is Dermatologist tested. It is also Hypoallergenic. So far this has been working very well. It claims to remove about 90% of all makeup and I would say that was a fair claim to make. Makeup of all types is removed but not all of it. It isn't as powerful as the main stream brand cleaners but I'm happy to use a touch more elbow grease to avoid the less desirable ingredients from the other main brand cleaners. This leaves my brushes lovely and soft an not overly fragranced. FIND IT: Shampoo ~ Superdrug (£5.99) Mat ~ anywhere/any price! And that pretty much sums up my 'greener' choices to washing makeup brushes in your hand. I'd love to know any suggestions for any other cleansers or shampoos to try out.